[S971] Image of the 1901 Census for Styrrup, Nottinghamshire: RG13 Piece 3127 Folio 52 Page 2. [S3] GRO Indexes to Marriages. "1896/Q2 PASK, Ellen Ada = WARD, John Worksop 7b 80." [S4] GRO Indexes to Deaths. "1905/Q3 WARD, John Doncaster 9c 495 aged 31." [S6] Teresa & Stuart Pask's Guesses, Theories and Speculations: Based on time and location; wife remarried in 1906. [S4221] Copy of the marriage certificate of Charles Park Matthews and Florence Amy Troughton, 26 August 1909. Obtained from www.ancestry.co.uk. [S5613] Image of the 1911 Census for Styrrup, Nottinghamshire: RG14 Piece 20245 Schedule 34. [S415] Website Ancestry Civil Registration - Births: 1898/Q1 WARD, Agnes Annie Worksop 7b 35. [S3] GRO Indexes to Marriages. "1898/Q3 PASK, Elizabeth = CARTER, George Worksop 7b 67." [S973] Image of the 1901 Census for Styrrup, Nottinghamshire: RG13 Piece 3127 Folio 52 Page 1. [S5612] Image of the 1911 Census for New Buildings, Styrupp, Nottinghamshire: RG14 Piece 20245 Schedule 13. [S2] GRO Indexes to Births. "1901/Q2 CARTER, George Albert Worksop 7b 33." Research Note: Not found in the 1901 census. [S417] Website Ancestry Civil Registration - Marriages: "1887/Q4 PASK, Eliza Worksop 7b 53 = William WALKER." [S970] Image of the 1891 Census for Styrrup, Nottinghamshire: RG12 Piece 2645 Folio 66 Page 5. Research Note: Annie is assumed to be Annie DICKINSON, however also cross-referenced in Marriages was HEMPSHALE, Ann or HEMSHALL. [S3] GRO Indexes to Marriages. "1874/Q2 PASK, John = DICKINSON, Annie Gainsborough 7a 1647." [S979] Image of the 1891 Census for Kexby, Lincolnshire: RG12 Piece 2636 Folio 43 Page 14. [S2391] Image of the 1881 Census for Kexby, Lincolnshire: RG11 Piece 3297 Folio 50 Page 7. [S2392] Image of the 1901 Census for North Road, Ranskill, Nottinghamshire: RG13 Piece 3118 Folio 46 Page 6. [S4] GRO Indexes to Deaths. "1908/Q3 PASK, Henry Worksop 7b 21 age 57." [S4] GRO Indexes to Deaths. "1928/Q3 PASK, Annie E Retford 7b 8 age 77." Research Note: No additional information found in GRO Indexes. [S2] GRO Indexes to Births. "1858/Q4 PASK, Betsy Gainsbro' 7a 589." [S980] Transcript of the 1871 Census for Beckingham, Nottinghamshire: RG10 Piece 3443 Folio 77 Page 5. (Image currently not available). [S2709] Image of the 1861 Census for Peatree Hill, Beckingham, Nottinghamshire: RG9 Piece 2407 Folio 80 Page 15. [S2] GRO Indexes to Births. "1861/Q3 PASK, Ellen Gainsbro' 7a 637." [S982] Image of the 1891 Census for Beckingham, Nottinghamshire: RG12 Piece 2633 Folio 74 Page 13. [S3] GRO Indexes to Marriages. "1897/Q4 PASK, Ellen = ROGERS, Frederick Lincoln 7a 1134." [S5607] Image of the 1901 Census for Trent Side, Beckingham, Nottinghamshire: RG13 Piece 2633 Folio 74 Page 13. [S5608] Image of the 1911 Census for High Street, Beckingham, Nottinghamshire: RG14 Piece 20132 Schedule 96. [S2] GRO Indexes to Births. "1855/Q3 PASK, Fanny Gainsbro' 7a 617." [S756] Information from the 1871 Census from Ancestry.co.uk - 1871 England & Wales Census (http://www.ancestry.co.uk). Further details available upon request. "RG10 Piece 3444 Folio 34 Page 26." [S3] GRO Indexes to Marriages. "1904/Q3 PASK, Fanny = BEE, John Gainsborough 7a 1511." [S5609] Image of the 1911 Census for High Street, Beckingham, Nottinghamshire: RG14 Piece 20132 Schedule 94. [S2] GRO Indexes to Births. "1853/Q4 PASK, Sarah Gainsbro' 7a 582." [S5610] Image of the 1871 Census for Epworth, Lincolnshire: RG10 Piece 4725 Folio 20 Page 34. Indexed incorrectly under the name of PARK. [S2] GRO Indexes to Births. "1887/Q3 PASK, Annie Gainsbro' 7a 756." [S2] GRO Indexes to Births. "1885/Q4 MATTHEWS, Charles Pask Pancras 1b 185." [S4218] Image of the 1891 Census for 2 North Quadrant, Brighton, Sussex: RG12 Piece 0811 Folio 153 Page 43. [S4219] Image of the 1901 Census for 6 Fortess Road, St. Pancras, London: RG13 Piece 0157 Folio 47 Page 38. [S3] GRO Indexes to Marriages. "1909/Q3 MATTHEWS, Charles Park = TROUGHTON, Florence Amy Edmonton 3a 985." [S4220] Image of the 1911 Census for 7 Marston Road, Teddington, Surrey: RG14 Piece 3517 Schedule 143. [S4] GRO Indexes to Deaths. "1956/Q1 MATTHEWS, Charles P. Bourne 3b 86 age 70." [S3020] E-mail from Colin Hart to Stuart & Teresa Pask dated 14 February 2008. 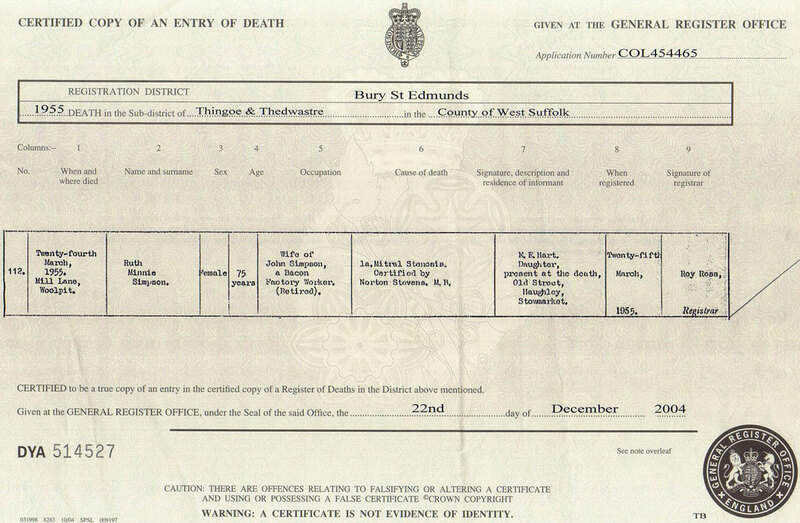 [S985] Copy of the death certificate of Ruth Minnie Simpson, who died 24 March 1955. Kindly provided by Maria Karg. [S2] GRO Indexes to Births. "1912/Q3 SIMPSON, Edith E. PASK Stow S. 4a 1845." [S123] E-mail from Maria Karg to Stuart & Teresa Pask dated 5 February 2008. [S3] GRO Indexes to Marriages. "1905/Q1 SMITH, Emily Margaret Bethnal Green 1c 201." [S986] E-mail from Michael Neal to Stuart & Teresa Pask dated 11 September 2006. [S986] E-mail from Michael Neal to Stuart & Teresa Pask dated 3 January 2008. [S3] GRO Indexes to Marriages. "1905/Q1 PASK, Walter John Bethnal Green 1c 119." [S986] E-mail from Michael Neal to Stuart & Teresa Pask dated 21 January 2005. [S2295] Copy of the marriage certificate of Walter John Pask and Emily Margaret Smith, 29 January 1905. Kindly provided by Michael Neal. [S4] GRO Indexes to Deaths. "1952/Q4 PASK, Emily M. Essex S W 5a 327 age 66." [S2] GRO Indexes to Births. "1907/Q1 PASK, Emily Margaret Bethnal G. 1c 201." [S2] GRO Indexes to Births. "1916/Q2 PASK, Violet M. SMITH W.Ham 4a 909." [S4] GRO Indexes to Deaths. "NEAL, VIOLET MINNIE 18 April 1916 LLANELLI 2000 February District No 8201B Reg No B35E Ent No 025 Dor 200." [S3] GRO Indexes to Marriages. "1936/Q3 PASK, Violet M. NEAL Epping 4a 1470." [S986] E-mail from Michael Neal to Stuart & Teresa Pask dated 3 January 2008: Dawnadil, Trimsaran Road, Llanelli, Dyfed. [S3] GRO Indexes to Marriages. "1928/Q3 HEAD, Alfred J. W Ham 4a 604." [S3] GRO Indexes to Marriages. "1928/Q3 PASK, Emily M. HEAD W Ham 4a 604." [S4] GRO Indexes to Deaths. "1965/Q4 HEAD, Emily M. Waltham Forest 5E 505 age 58." [S2] GRO Indexes to Births. "1905/Q2 PASK, Walter John Bethnal Green 1c 119." [S4] GRO Indexes to Deaths. "1905/Q2 PASK, Walter John Bethnal Green 1c 87 age 0." [S2] GRO Indexes to Births. "1905/Q2 PASK, Walter John Bethnal G 1c 119." [S4998] Website Deceased Online (https://www.deceasedonline.com). [S2] GRO Indexes to Births. "1875 Q4 PASQUE, Faith Gertrude Blything 4a 697." [S994] Family Tree of Herbert Bunt, provided 23 November 2004. [S1014] Image of the 1881 Census for Worlingham, Suffolk: RG11 Piece 1899 Folio 119 Page 2. Enumerated under the name of PARSQUE. [S1015] Image of the 1891 Census for Worlingham, Suffolk: RG12 Piece 1489 Folio 133 Page 7. [S3] GRO Indexes to Marriages. "1904/Q4 PASQUE, Faith Kensington 1a 405?" [S1063] GEDCOM file created by Martyn K. Elmy, 10 February 2005. [S1035] Family Album of Herbert Bunt, scanned 23 November 2004. [S3] GRO Indexes to Marriages. "1928/Q3 BENZ, Leo H. TOOMEY Kensington 1a 527." Residence Place: Tonbridge, Kent, England.